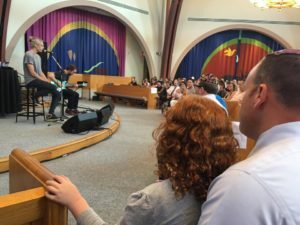 On Friday night Beth El had the honor of hosting the world renown musician and vocalist Matisyahu, along with guitarist Aaron Dugan. The evening was electric and the emotion, joy and energy in the room was palpable. After the concert and into the early part of this week people have asked if I was happy with the turn out, the number of people who attended. I will admit that I was was quite pleased, 450 people at any event is a success, yet attendance was not the goal. The goal, which is much more difficult to measure was creating community and meaningfulness. As we sit in 2016 we are watching Judaism reinvent itself in front of our eyes. For years the cornerstone of Jewish Engagement revolved around Shabbat and Holy Days. Those days were sacrosanct and they brought Jews into the building, yet what we have learned is that those days are fleeting, if they even exist at all. I find weekday and Shabbat services to be meaningful, it gives me a break from the week, a time to both reflect on the week that was and spend a few moments thinking about the week that will be. That works for me…but if I have learned anything in the rabbinate, it is that I do not have a monopoly on what works for all people. For some, taking 15 minutes to sit by a lake or in a field, or to go for a run is a spiritual/religious experience. Every individual is touched through a different set of experiences, the trick is finding what works for people and doing it. Friday night was a success because of the diversity of those who attended. It was a success because of the number of new faces in the building, whether for the first time in months or years. It was a success because Judaism is more than sitting through a worship services, it can be listening to a lecture or a brilliant musician. To those who said it was “outside the box”, I would agree, but add that our box needs to be made big enough that such experiences fall within it. I was sad that I was unable to attend but I heard wonderful things! Thinking outside of the box is always a great concept!